For me, scrapbooking is about memory keeping – and I have horrible long-term memory. So I really count on my scrapbooks to help me remember all those awesome (and not so awesome) moments in my life. I like the ability with pocket page scrapbooking to get photos in albums and get the memories down. It’s not always the fanciest or more artistic method but it accomplishes MY most important goal at the moment and I love it. I figure “someday” I can go back and do regular layouts and I’ll have the photos in one place and some journaling already done as a starting point. – Keeping them in the boxes/packages they come in stored vertically on a bookshelf. – Storing them on horizontal shelf cubes like the ones sold at MICHAELS. – Leaning them in a large bin under my desk. Well, they all seemed like good ideas at the time, LOL! But for various reasons, they didn’t work out for me (hard to access, got dusty, hard to find the type of protector I needed, etc.). 1. Choose a good sturdy 12×12 D-ring album to use. For now, I’m using a turquoise Sn@p! album for my divided protectors and a light green Project Life album for my plain protectors; I had to separate them because I have so many to store! Eventually, I’ll need those albums for projects so I’ll get some others to replace them. I’m thinking of getting 2 or 3 of the 12×12 Project Life albums when they’re on sale at Michaels in a cute pattern to set them apart from my solid color WRMK albums that house scrapbook pages. 2. Gather all page protectors, take out of boxes and packages, and place into piles by type. They’re very slippery and hard to deal with. Find a large space like your bed or an open table if you can. 3. 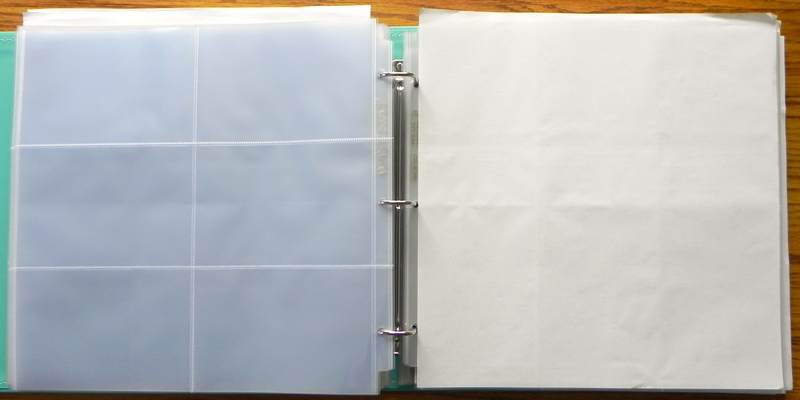 For each type of page protector, straighten the pile so all the binder holes line up, and put a large binder clip along the right edge halfway down. Don’t worry, this is temporary and won’t damage your page protectors if you remove it quickly. 4. 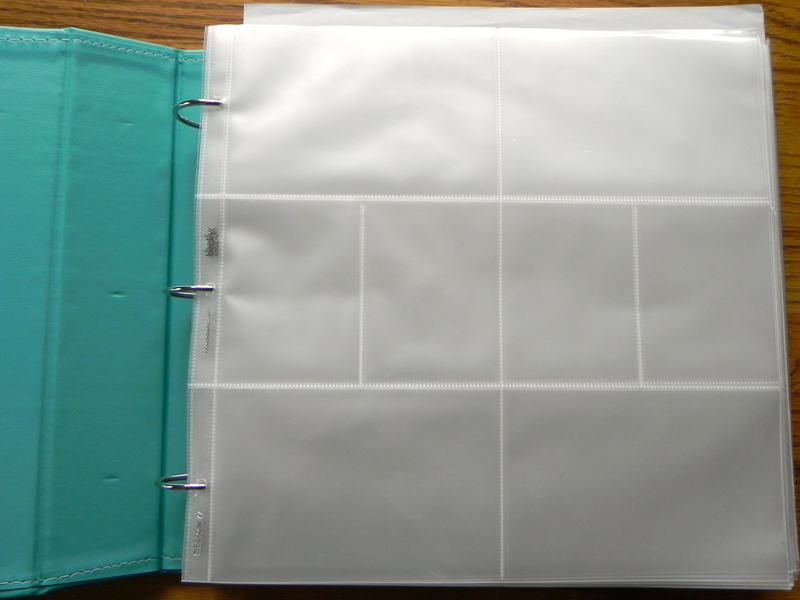 Start filling your album, with your mostly commonly used page protector types at the front. I use mostly Becky Higgins Design A and BH/WRMK (6) horizontal 4×6’s so those go first. Tip: Even though the page protectors are clipped together, they still will slide a bit and not line up perfectly. Try inserting the center binder hole first; once that’s lined up, the other 2 holes will line up and insert more easily. 5. Separate page protector types within the album using your divider of choice. 6. Remove the binder clips and let your page protectors be freeee! And you are DUNZO. Now you can enjoy the ease of having all your various page protector configurations in one place and finding the exact type you need while you scrapbook. – A 12×12 album full of page protectors is VERY heavy. – You need a large space to have the binder open while you’re working, unless you don’t mind pulling it out and opening it each time you need a new type of protector. Even with the downsides, I still think this is the best method for storing 12×12 page protectors. They’re so slippery and hard to deal with, I’ve found that having them secured into a D-ring album is the only way to consistently access them without going cray-cray. Project Life: “My Story” PL Kit from HSN	Scrapbook Novel: Who Wants to Win a Copy?!? I think this is a brilliant idea! Thanks for sharing. Well, Sandy, are you in for a treat! Wait until you hear about the new blog I’m getting ready to announce ;) How’s that for a teaser?? That’s how I store mine, too! I snagged a couple albums at Tuesday Morning to store mine in. Great minds, Erica … (and we share a name, too, though mine is “with a K”). I just switched mine over to this method a few months ago. Works well! Glad to hear another recommendation for this method, Debra! PS. I agree, they are heavy when full and you do have to have space to open the albums to access the protectors, but it’s still the best system I’ve found. A new blog?? I’ll be reading! I use this method too… my “dividers” between the types of sheets are just post-it notes. Makes it quick for me to jump to the next type. Post-it notes are a great idea! Talk about not adding any bulk or weight. Thanks Emily! My dividers are little strips of washi tape adhered to the top right/outer corner of the last page of one PP-type, so these tape ends form both a little flag and a way to easily pull it up and lift over to the next configuration. Washi tape is also a great idea, Julie! I’ll bet it looks much cuter than my plain white tissue paper. Thanks for sharing the tip! I do memory books & use a lot of A4 (UK) sized page protectors & also US sized ones. I kept finding that some of them would curl over etc if I put them in a drawer, so I’m going to put them in A4 arch files/binders. 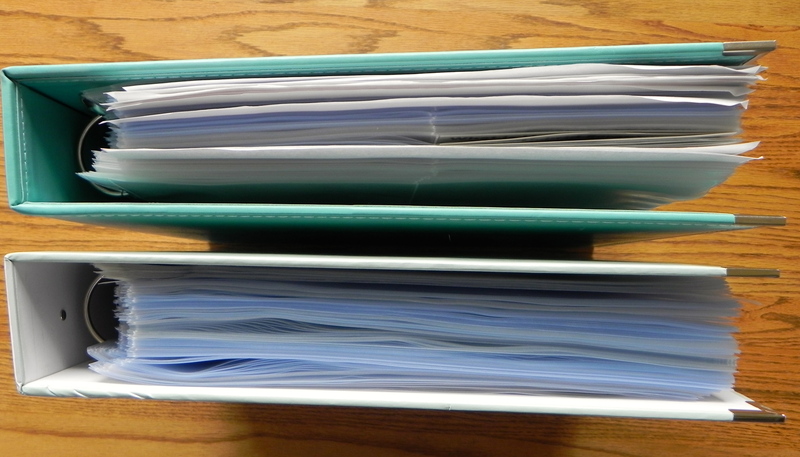 A quick tip: If you find the 12 x 12 binder too heavy you could always divide them between 2 of them. That sounds like a great solution for your A4 protectors, Julie! And thanks for the tip about using an extra binder. I have to confess I’m on binder #2 since I have SO many divided protectors. I like to stock up when I find them on sale ;) Thanks for stopping by and for taking the time to comment. I appreciate it!